I am trying to get a little ahead on my Valentine’s Day cards. My older daughter’s birthday is on that day and my son’s birthday is two days later. So it’s a busy week in our house! I don’t want Valentine’s Day to get lost in the shuffle, so I need to do some prep ahead of time. 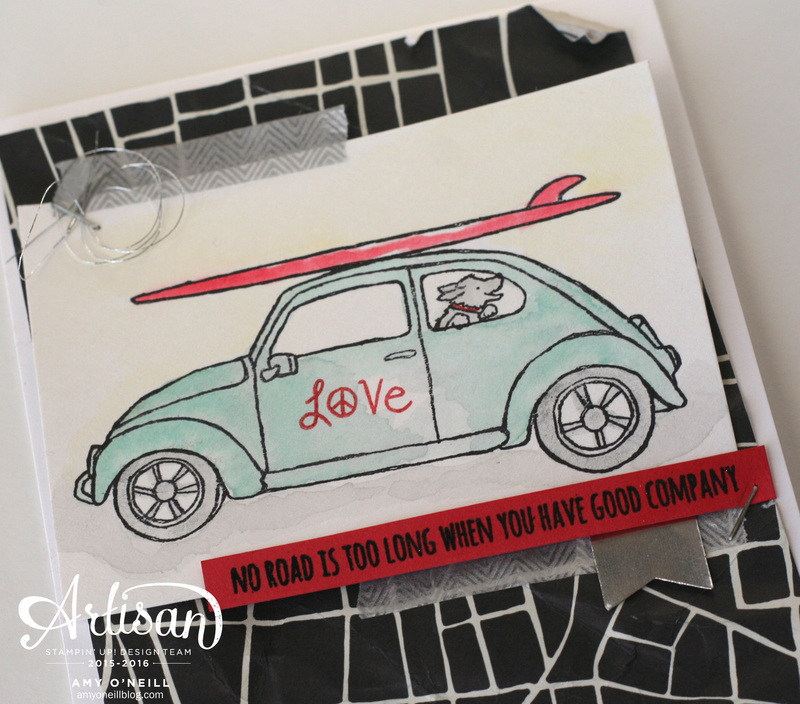 I decided to make a Valentine’s card for my husband using the Beautiful Ride stamp set. I love this cute little car! My next-door neighbors in the small town where I grew up had VW bugs, which they used as delivery vehicles for their pharmacy store. Yes, pharmacies used to deliver your prescriptions to your home! Since their family had several of these fun cars, there seemed to always be at least one parked in their driveway. Now, whenever I see a VW bug on the road, I always think of their sweet family. Sorry for the trip down memory lane! I decided to use a sheet of the Going Places dsp. Not only does it have some prints which are perfect for masculine cards, but it has some sheets that look like maps, which I thought would pair perfectly with the car. I crumpled up the piece of dsp and then flattened it out before adhering it to the card base. I then stamped the image on some Watercolor Paper and colored it with an Aqua Painter and Pool Party, Basic Gray, Smoky Slate, Real Red, and So Saffron inks. 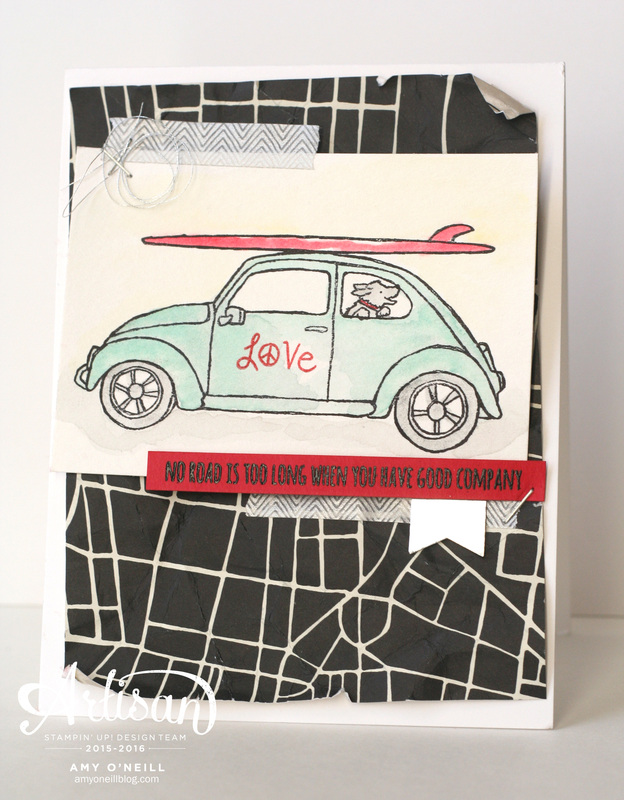 The sentiment was embossed with black embossing powder on Real Red card stock. I added a little washi tape, Silver Metallic Thread, Silver Foil Sheet (punched with the Banner Punch), and staples. This was a pretty quick card to make, and it was fun to color.